How to Change Language in Android? 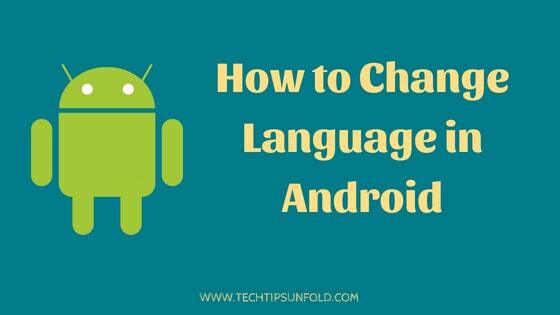 If you are looking for step by step guide on How to change language in Android, then this article is for you. We will take you through detailed process with relevant screenshots on How to change language in Android. If you’ve recently bought a brand new Android smartphone, it comes with default language set. Most of the smartphone manufacturers set that default language preference to English (UK). If you are a native of other language region then you can easily change language in Android. Android comes with lot of advanced customisation options. You can easily change language preference in Android by following this step by step guide. These settings options are different for different Android versions. Among the available Android versions, Marshmallow and Nougat OS is having similar settings whereas for Oreo, you have follow different method. We will list down How to change language on Android for both the version. If you don’t know which Android version you are using, Just click here What is my Android Version? Here is the precise procedure for changing language in Android for Marshmallow or Nougat versions. Step 2: Scroll down a bit and you can find ‘Additional Settings‘ option under ‘System and Device’ section. Step 3: Click on Additional Settings to find explore more advanced Android settings. Step 4: Now you will find ‘Language and Input‘ option. Just tap on that. Step 5: It will take you through the all the language related settings. Find Language tab in that and Just click to view all the available languages in your Android version. Step 6: For changing the language, select the one which you want to set for your Android mobile. Now it will popup a window asking you confirm on changing the language. Step 7: Once you tab on ‘OK‘ button, your language preferences will be saved and you can view all the options in your desired language from now on. So using these mentioned steps, you can easily change the language in Android Marshmallow or Android Nougat smartphones. Changing the language in Android Oreo version is also quite similar to previous one. But those options will be present at different places. We will go through step by step on How to Change Language on Android Oreo version. Go to Settings in your Android Oreo smartphone. Now under the list of all settings, choose ‘System‘ setting option. It will take you through advanced options like changing the time and date, region, language, backup, updates etc. Choose ‘Language and Input‘ option in that and select the language which you want to choose. It will ask you to confirm the changes. Once you click OK, new language changes will appear. So these are the simple steps how you can change language in your Android Oreo smartphone. Once you change the language using these mentioned steps, only display language will change and you should be able to see all the options in your preferred language. But for Google Keyboard and if you are using any other Keyboards like Swift Keyboard, you can type only in default language. But don’t worry. You can change Keyboard language as well. You can change all keyboard languages using this method. We will present precise steps on How to change Keyboard language here. Step 2: Go to additional settings option labelled under System and Device Section. Step 3: Choose Language and Input in those options. Step 4: There you can find ‘Keyboard and Input methods‘ option with list of available Keyboards in your Android smartphone. Step 5: Now select each keyboard and select the language you want to set. You can even change the language for speech recognition as well. So using these steps you can change Keyboard language in your Android smartphone easily. With this I’m wrapping this article on – How to change Language in Android. Few additional steps are also used for changing the preferred language for keyboards and voice recognition as well. If you find any issues, please let us know through comments section. We will glad to help you! How to Check IMEI Number in Android and iPhone?